Jordan Peele took the world by storm back in 2015 with his directorial debut, “Get Out.” Shedding his improvisational/sketch comedic roots and embracing the genre he has loved and studied all his life, Horror. This debut won him the Academy Award for Best Original Screenplay, and the pressure placed by horror fans anticipating seeing if he can deliver the ever-elusive successful sophomore film. While Peele has lost the element of surprise with the audience, it is inevitable, to call Us anything other than a successful follow-up and a delivery on the promise of more original horror stories would be short-sighted. Let's talk about it. The story follows the Wilson family driving down to their vacation home near Santa Cruz boardwalk. The mom, Adelaide (Nyong'o), is dealing with some anxiety due to her past experiences as a child in that boardwalk and thinks something wrong is going to happen. Ignoring her intuition, due to the insistence of her husband, Gabe (Duke), they go down to the boardwalk. When they come back to the vacation home, they are met with a family of doppelgängers, led by Red (Nyong'o). Now Adelaide must fight to keep her family alive as events start to unfold around this family-friendly boardwalk. Before I move on, there is a bible quote that perfectly describes this film, and it's mentioned multiple times, through signs, sports scores, and clocks, Jeremiah 11:11; "Therefore this is what the LORD says: 'I will bring on them a disaster they cannot escape. Although they cry out to me, I will not listen to them." 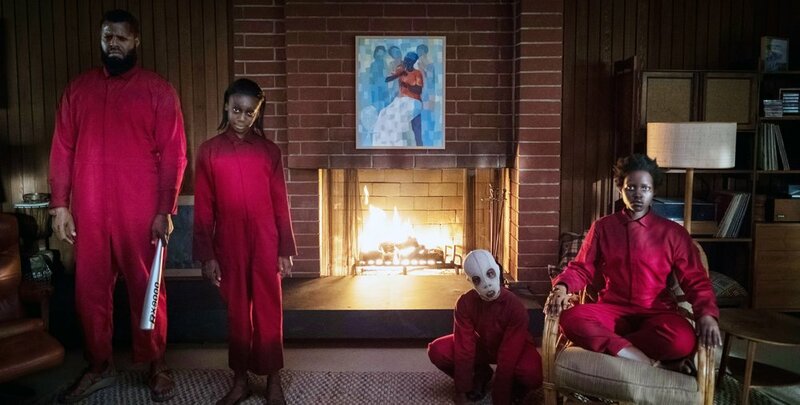 Peele's script once again embraces the horror tropes fans come to expect and utilizes that expectation to showcase new ways the tropes can service the story. One can see that Peele is fascinated in exploring the nature of identity, and what makes us... us. Both in "Get Out" and in this follow-up, we are presented with a situation that forces the audience to question what is on the surface, as things feel out of place. It can also be seen as an allegory of the culture of America, and the deeply rooted underbelly can rise to the surface. The first act sets up multiple payoffs for anyone keeping track, and there is not a moment or a twist that is not earned. I do love that the films jumped around the sub-genres of horror, with home invasion, suspense-thriller and slasher elements infused throughout without feeling like a jarring shift in tone. Quick note: I did not entirely love the story, as it has logical flaws in my head (I tend to overthink), and I do wish that the ending was kept for audience members that paid attention and for those that will click upon re-watch. It felt like Peele gave us the answers, instead of letting us create our own. But this is a minor nitpick and more of a "me” problem, and even with that complaint, I enjoyed this film. This time around Peele teamed up with cinematographer Mike Gioulakis (Glass, It Follows) to create a beautiful color palette -bold red colors and the gold scissors - and stylistic shots that embrace the doppelgänger story element - use of reflection and duplication of shots. This film is gorgeous. The special effects are perfect, as it never felt for a second that the family and the doppelgängers weren't in the same room. The use of the score, just like in "Get Out," adds to the story and the themes on screen. The score is bombastic and overwhelming adding to the tension mounting on your shoulders. Quick note: the sound design of this film it adds so much to the tension, as you hear every single movement of the scissors, no matter how minimal it is. Lupita Nyong'o's dual performance asks a lot from her, and luckily for the audience and Peele, she has the talent to fill ten roles if needed. Her performance alone makes me want to revisit this film and study all the nuance she brought that created two fully fleshed out characters. The rest of the cast is excellent, and I was surprised by the kids, especially having dual roles. Winston Duke is the comedic relief of the film, Elisabeth Moss and Tim Heidecker add a lot to the story, and they embraced their roles to the fullest. Us is a smart, funny, tension filled ride that fans of the horror genre will love, and it could be a bridge for the moviegoer that tends to avoid the genre. The craftsmanship behind every single element that went into this film shines through each frame, and you can tell that Peele is a true student of cinema. Us is a Glass Half Full.